Does Battle Ready Work to Build Muscle? Maybe you are a top athlete looking for an edge or may you are an average person who is sick and tired of being sick and tired and you want to find a way to boost your energy and move to a higher level of living and just feel better about yourself in body, mind and spirit. Well, the good news is that modern science and some often age old herbal studies have led to a number of very exciting breakthroughs in supplements that can help anyone raise their game in this endeavor. The problem facing anyone in this pursuit is that, because the market for these types of supplements has boomed in the last decade or so because of all of these advances and the demonstrable results that are being achieved by the best supplements, there has been an ongoing race by just about anyone capable of producing a supplement and putting together a marketing strategy that allows them to put their product on the market the public's ability to know which of these literally hundreds of choices actually work. This process is made even more difficult given that so many of these products tend to have nearly identical sets of ingredients and make very similar claims. 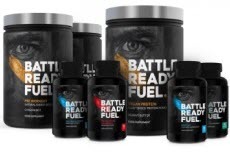 This being the case, we, as part of our ongoing efforts to help our valued readers find the products that are most likely to work for them, have decided to take a long hard look at one of the most talked about supplements available on the market today - it's called Battle Ready. Battle Ready's line of twelve different nutritional supplements aim to provide people with everything they need to drastically improve the ability to take advantage of every aspect of their lives on a physical, mental and spiritual level. The difference that this unique product offers from most other supplements is that it provides the ingredients necessary for the full and rounded needs of every aspect of human existence. Clearly this is an advantage of bodybuilding supplements which only target the physical aspects of self-improvement such as muscle building and fat burning or brain enhancing supplements which only target cerebral functions such as improving mental clarity. Battle ready is its own company and its formulation is derived from a field tested set of ingredients employed by some of the United Kingdom's elite military service known as the Special Air Service or SAS. Specifically the formula is based on the one used by ex-SAS member Ollie Ollerton and his unit the Breakpoint company. The Battle Ready company currently offers twelve different nutritional supplements and each one is designed to enhance a different part of the user's mind, body and spirit. Information regarding pricing, guarantees and other background information can be found on the product's official website. Liquid Collagen: Designed to insulate joints from wear and tear during intense physical activity. It is flavored with mango and passion flower drink and is based on a formula of high impact protein and essential amino acids. Super Greens: Condenses the raw essential nutrients from all-natural plant matter into a convenient powder form. Fish Oil: A high impact source of Omega-3 fatty acids proven to benefit heart health without adding on unwanted additional calories. Nootropics Stack: Create to substantially improve cognitive skills as well as concentration, memory, brain functioning and mental acuity. Multivitamin: Designed to cover all the based and fill in any gaps in your diet in order to boost one's mood, increase short-term memory and lower anxiety levels. Creatine: A prerequisite for building muscle in any meaning amount this substance is a staple for any serious athlete. BCAA: Provided in a Cherry Burst flavor this element provides users with a pre-workout supplement designed to boost performance and reduce post workout pain and soreness. Vegan Protein: A mixture of pea and hemp powder plus peanut butter flavoring to give created to replace the elements of meat for Vegans. Whey Protein: Presented in the form of a Triple Chocolate drink this highly ranked protein supplement helps to build muscle without any significant sugar, fat or carbohydrates. Fat Burner: Designed to boost the metabolism and curb appetite this thermogenic helps to achieve weight loss goals. Pre-Workout: Designed to prepare the body and mind for the upcoming stress related to high level physical activity. The producer of Battle ready, like just about any company offering these types of products offers a significant amount of information related to the ingredients used in the product line including data regarding the acknowledged benefits of these ingredients. What the company does not offer is any direct information regarding any research, studies or clinical trial data that would support the claims made as to effective the actual formulation of these ingredients act within the scope of this particular product. This simply means that, although there is little dispute as to the benefits of the actual ingredients the evidence of how effective they are within the formulations used by Battle Ready are not well defined or documented. Battle Ready does offer testimonials for customers but, as with any product, seller approved testimonials or user reviews have a distinct bias. This being the case we set out to find some sources of more independent reviews. Looking at a number of industry related websites and chat rooms discussing the subject we found many reviews of Battle Ready products. The consensus among them was that Battle Ready products simply do not deliver on the expectation laid out for them. The various Battle Ready product line items can be purchased separately or in bundles depending on the user's goals. Individual products are priced from $29.99 to $49.99. At this time bundles range from $134.99 to $249.99. Back at the top or this review we talked about how everyone from top athletes to the average person are interested in feeling better and allowing themselves to be prepared for all the challenges that life puts in front of all of us each and every day on a physical, mental and spiritual level. One way to overcome these issues is to find ways to boost our capabilities of dealing with these problems and for many the answer can be found in powerful supplements which have become a staple of modern living. The problem for many comes in when it becomes time to actually choose these supplements because of the great profits that can be made and the fact that there are so many inferior products out there. Another issue is that while most products are designed to only address one of the body, mind and spirit triangle there are some that deal with all aspects of life. Looking specifically at the company and product known as Battle Ready there are just a few things that need to be considered in order to know if it may be right for you. The first is the set of ingredients and from what we can evaluate they are comparable to any of the best available on the market. The second is the effectiveness of the formulation for this line of products and, by all accounts, Battle Ready does not make available to kind of data necessary to determine whether or not it can live up to its own claims. The third thing is that the majority of actual users that we encountered in our search did not believe that they received the benefits that they expected with the use of these products. In the end there is little doubt that the Battle Ready line of products has not earned its place among the top performing supplements available to the public.